I’m slightly obsessed with Laphroaig. I’ve been a fan for a while, but over the last couple of years, ever since trying a 1990s version of Laphroaig 10, I’ve grabbed every one of their new releases, bought a few older ones at auction and investigated independent bottlings. Their new releases over the last few years have focused around Travel Retail, formerly known as Duty Free, with Triple Wood and PX appearing on the shelves. The former has now been moved into the general market, replaced by the latter, and this month they announced that another whisky had been added to the Travel Retail exclusive line-up – Laphroaig QA Cask. I don’t do much travelling through airports these days, but a recent jaunt up to Scotland for work started with an early morning flight to Edinburgh and a brief stop in World of Whiskies in Heathrow netted me a bottle of the Laphroaig QA Cask. It’s a very recent release, having been introduced at the beginning of April, and I wasn’t sure if it would have arrived yet. Fortunately it had, although recently enough that the guy behind the till in the airport asked me if I’d tried it, as they’d not received any tasting stock yet and hadn’t been able to taste it themselves. The QA Cask is instead matured in ex-bourbon casks and then finished in new, uncharred American oak casks – the QA being an abbreviation of Quercus Alba, the latin name for American oak and the, rather generic, term used to referred to wood from North America. How long the finishing period is unstated, but they use the term ‘double matured’ on the label, which suggests a decent amount of time. Although as there is no age statement on the bottle exactly what that means is difficult to say in terms of months or years. 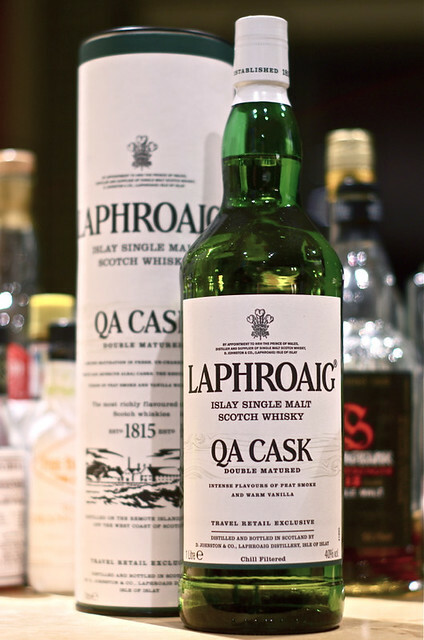 That lack of information about time is another thread running through all of the recent Laphroaig releases, with Quarter Cask, Triple Wood and PX all being No Age Statement releases, and all of them matured in ways to allow greater wood influence with a smaller amount of time in the cask. The smaller quarter casks used as the second stage of maturation in those three give a greater spirit/wood ratio (a 30% increase according their website), allowing the oak to do some of its magic quicker. The maturation process is a bit more complicated than that, with m’colleague Tim happy to talk about tertiary maturation and the effects of greater time in wood with little prompting, but it does give some more ‘mature’ flavours that would take longer to develop without the smaller casks. The QA Cask takes a slightly different approach, swapping the small cask for one made of new oak, rather than ‘used at least once’ wood of the quarter casks. With no whisky having touched the wood before it contains a lot more flavour compounds and thus transfers them to the whisky much more readily than in a cask which has already had many of them extracted by a previous fill. However, they are also uncharred casks and the charring process helps to ‘activate’ the wood, as well as creating a layer of char that acts a bit like a Brita filter as the spirit passes back and forth into the staves. This lack of activation should mean that the casks don’t give up their flavour compounds quite as readily as a charred equivalent, so things should be more restrained than in many other virgin oak matured whiskies. 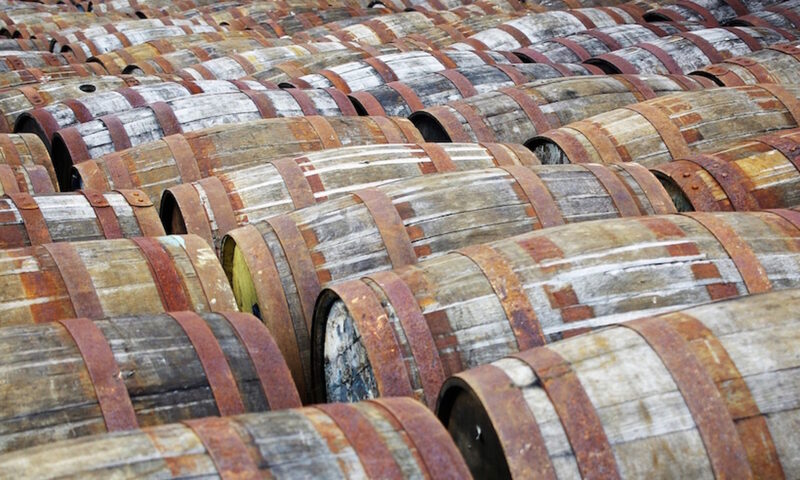 So, the QA casks should give more woody flavours more quickly, although they will be different flavours to that found in whisky not matured in virgin oak, and will have less of the ‘purification’ that you get with a charred stave. In short – lots of variables. But what does it taste like? It’s a bit softer and both less medicinal and punchy than the regular 10 year old. When I first tried it I found it a little too focused on new wood, but after a second taste it’s much more balanced and restrained than other whiskies aged in virgin oak that I’ve tried. It’s a thick and sweet Laphroaig, toned down from what you might expect but still a nice dram – I’d put this under the heading of ‘quaffing whisky’ rather than anything more complex. …and for those who are a bit geeky about such things, it looks like they’re in the middle of a packaging update: the stopper (as seen above) now shows a still rather than the founding date, and both the tube and label differ from the design of the Triple Wood and PX, taking on the simpler design of the 10 year old. The next new addition to the Travel Retail line-up, An Cuan Mor (The Great Harbour, from my searching of Scots dictionaries online), will be appearing later in the year, which should show us how the design will evolve. Over the years each expression has had a slightly different packaging design so it has all got a little messy. We have now reworked them back into one family design. It is not a huge change- as you would expect. But the whole family looks a lot smarter now I think. 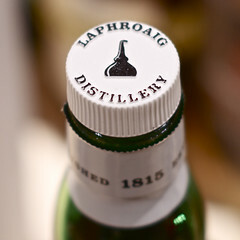 Of course we researched these changes thoroughly with many Friends of Laphroaig first to make sure you liked it. So a big thanks to all of you who participated. If you cannot wait, you can see the new 10 year old design here. I hope you like it. Islay Single Malt Scotch Whisky, 40%. ~£45/€55 in Travel Retail.